Building an extra building next to your office factory will take you longer. For this reason cleanroom have become than erecting a worthwhile investment in terms of creating space for your goods and supplies. Cleanrooms are controlled environments where you can produce s products or store end products, by ensuring airborne particles are controlled. A cleanroom line includes 3 distinct wall systems with numerous components that ensure that you have the right type of application. Contamination can adversely affect the working environment. Air flow rates and direction, pressurization, humidity and specialized filtration are controlled in one room. Unwanted particles are either controlled or eliminated from the cleanrooms with air filters fit in the room improving air quality. Mostly found in electronics, pharmaceuticals, biopharmaceuticals and other manufacturing environments. If you monitor the air in a cleanroom compared to a typical office building then you can see the difference in air quality. A class 100 cleanroom is designed to never allow more than 100 particles per cubic foot of air. Investing in a well constructed cleanroom protects your production rate and improves your output. A modular cleanroom will protect your processes from harmful contamination thus saving your organization time and money. Cleanrooms must be maintained and cleaned to the same high standards to ensure no contaminants are left in the building. Looking around for cleanrooms can be an overwhelming experience but we help you make the final decision. With the cleanrooms the panels, windows and doors common in other modular buildings that meet class 1000, class 10,000 and class 100,000 needs. With our experts we give you the knowledge that combines our wall systems with appropriate components that meet the strictest requirements. By utilizing the wall cavity cleanrooms incorporate a hidden return air chase system. 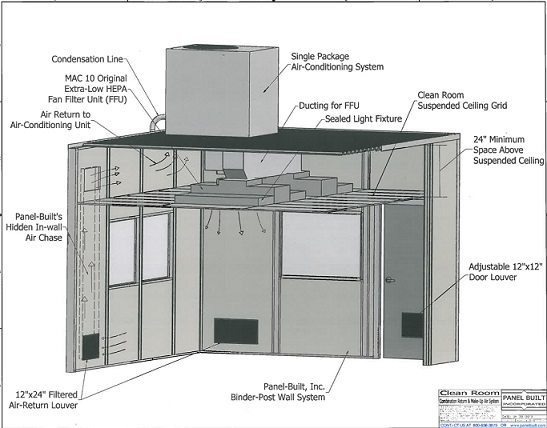 We build cleanrooms that are properly sized and well constructed to eliminate the expensive ductwork. The walls associated with hard wall modular cleanrooms systems translate into the final product that are easy to install. The final product is professionally constructed but is less expensive and more attractive. We work closely with our clients to come up with the right kind of structure to fit the function and needs. We continue to be the leader in procuring the best cleanrooms as we work closely with our suppliers to get the best and quality materials. We do our best to deliver as per industry standards for cleanrooms. Controls contamination in the area and effectively reduces wastage during your manufacturing process. It can easily be extended or relocated. Running costs for cleanrooms is low due to localized area. Cleanrooms can easily be constructed or bought directly from panelbuilt. You can have one designed at panel built using your own specifications as our engineers are always at hand. We have a collection of cheap modular cleanrooms for sale that you can choose from. 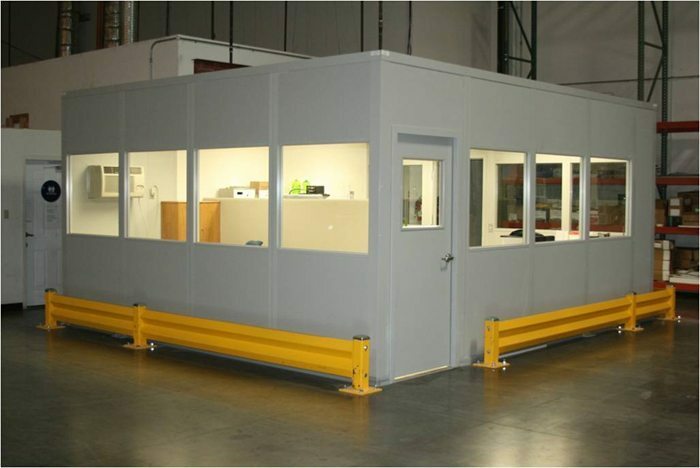 The prefabricated modular cleanrooms are constructed with proper components for air filtration. With the best available modular cleanrooms mezzanine type of buildings that will serve you with more space. Modular cleanroom mezzanine designs are well fitted with proper components to withstand the weight of the occupants. Generally these structures are stronger and can accommodate a number of people. There are cheap available ISO 6 cleanrooms for sale from different distributors. ISO 6 cleanrooms are determined based on the air changes per hour. Achieving a cleaner class of cleanrooms is all about air flow bringing air through vents in the floor or walls. The wall systems for modular cleanrooms are predesigned to fit your recommended structure. If you want a custom designed model then the recommendations from our engineers will help. Apart from panel built you can find wall systems for modular cleanrooms available online and get a quote for the recommended size and shape. Cleanrooms are sensitive in terms of construction, usage and cleaning them. Here are a few things to consider as you invest in cleanrooms or controlled environments. Application- you need to know the primary reason for investing in cleanrooms space. It’s important to define the use and function of the building. These will go a long way in helping you make the decision. Know how it works- cleanrooms basically act to protect your processes from air and contaminants. This means that it protects your processes and reduces wastage. ISO standards- this are the industry norm for rating cleanrooms. A serious ISO research will show which cleanrooms are internationally accepted by industry standards. Modularity- cleanrooms with modular layout give you enough room for expansion without building it from scratch. Investing in properly structured cleanrooms requires professional knowledge and expertise. We help you to design, build and with cleaning procedures. Cleaning cleanrooms requires a certain standard to keep the contaminants out of the building. We use modular designs that are easy to expand and if you want to move our experts help in the process. As you create the next cleanroom think about the processes, exits and entries especially with packaging of processed products.